We arrived in Sydney on 17th October and went to stay with Katharine’s brother Chris and his partner Jane in their recently restored fine art deco apartment in Coogee Beach with a fine view over the ocean (see above). The first evening here, we went out for a Lebanese feast, meeting several of Jane’s family, including a cousin, her brother and sister-in-law and their children. A great way to start the Australian part of our holiday. As Chris and Jane were still working on the Friday, we had a lovely lie-in to recover from the busy-ness of Hong Kong, before setting out on the northern leg of the coast path which runs from Bondi to Maroubra. It was a lovely sunny day, if breezy, and we enjoyed the sub-tropical plants, butterflies and birds, always calling, as we strolled along the cliff path or down on the shoreline. Indian Mynahs were everywhere, as were Australian magpies with their beautiful whistling song. We also saw Australia white ibis; the highlight was a fairy wren, so delicate and colourful that at first I thought it was a large butterfly. 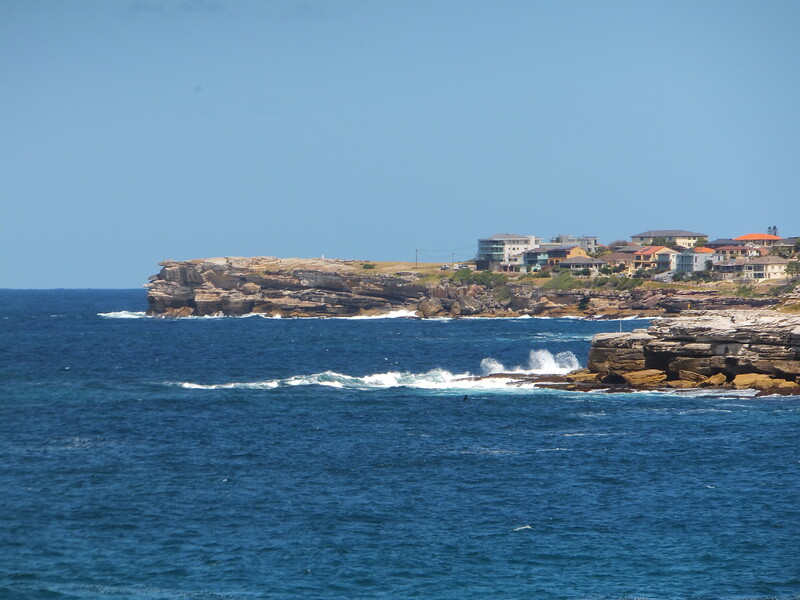 One interesting place we walked through was Waverley Cemetery, dramatically sited on a headland above the sea. The path winds along little coves and bigger bays, where we watched some gallant surfers. In such lovely weather it was clear that people dash to the beach right after work or school. Back at the apartment in the evening we admired Chris’s hanging box garden with a mix of flowers, leaves and herbs, some of which we enjoyed with our evening meal. We listened to the birds returning home as dusk drew in, notably a fine display of rainbow lorikeets in a nearby tree. After lunch on the Saturday we did the southern leg of the walk, from Coogee to Marouba. At one stage we had to leave the path and walk through some houses – there’s a very interesting mix round here of older, often art deco, buildings together with interesting modern houses, often big and expensive-looking, as well as some less interesting apartment blocks, but nothing high rise here,which is a big difference from Hong Kong. The local authority and residents are making a big effort to reinstate the coastal wetland so there are lots of interesting pockets round the path, including a hanging marsh under the cliff top, where we heard froglets and frogs. There were lovely flowers, a few butterflies, though it was still rather windy, and various interesting birds, including a group of little pied cormorants huddled under a cliff overhang, lots of swallows darting low, a buff-banded rail in the little marshy area, another marsh bird which may have been a golden-headed cisticola, and lots of noisy miners. There was also a moth clinging determinedly to a concrete step. Back with Chris and Jane we enjoyed the evening view from the balcony followed by a barbecue, as we watched the sun set behind us and the roosting birds. Sunday for Chris and Jane means cooked breakfast, so we enjoyed scrambled eggs and mushrooms and lovely nutty toast with a mug of the barista’s coffee – Chris has a splendid little machine which makes a good espresso and an even better flat white. Then we set forth south to Port Hacking (Sydney Harbour, south to Botany Bay, and P H is the next one) through the Royal National Park. Richard was with Chris, who was delivering an old car to their friends in Bundeena, where we had lunch. 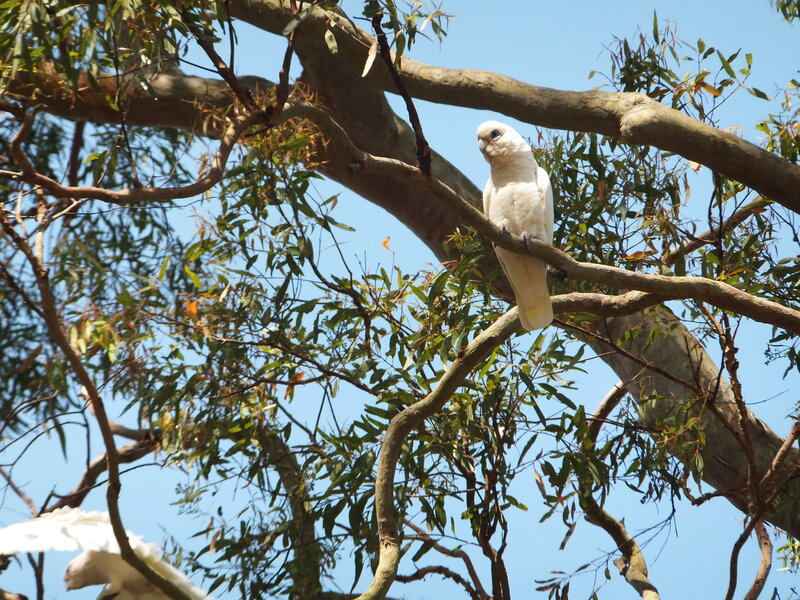 We walked into the park over the road from their house to admire the huge twisted gum trees and watch sulphur-crested cockatoos and little corellas with their blue eyes. Even saw a pair mating high in a tree. In a tree overlooking the garden we saw a large bird which might have been a paradise riflebird or maybe some kind of butcher bird. After lunch we strolled by the beach. Richard swam and said it was lovely. Katharine just paddled and looked at the extraordinary knobbly growths on the rocks which squirted when pressed or when saturated by the waves. As before there were lots of rainbow lorikeets flying around.